Researchers found a rare frilled shark, a prehistoric creature that lives up to 4,200 feet below the sea and was around during the time of the dinosaurs. 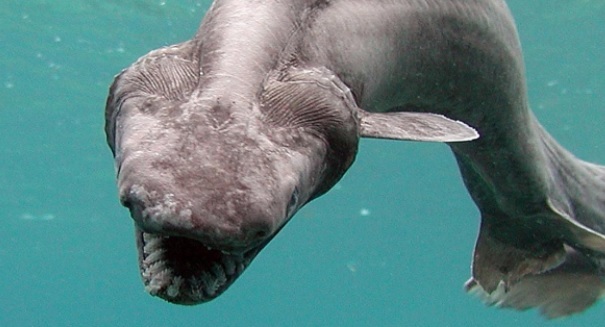 Scientists made a remarkable discovery off the coast of Portugal, as we reported recently, finding a rare frilled shark that has a terrifying appearance. But there’s so much more to this fascinating species that most people are not aware of, and scientists themselves didn’t know until recent years. The frilled shark was found during a research expedition aimed at minimizing unwanted fish catches that was commissioned by the European Union. The frilled shark has been unchanged for virtually 80 million years, meaning it lived during the time of the dinosaurs, and humans rarely encounter them since they live 390 to 4,200 feet below the ocean waves. Scientists didn’t discover them until the 19th century. Despite their fearsome appearance, frilled sharks have never attack humans, although they have sharp, jagged teeth that have caused some unintentional cuts on examination. This species was first seen in the wild back in 2004 off the southeastern United States coast, and Japanese fisherman found a sick one in 2007.